One of the greatest lectures I ever heard was from Fr. Michael Gaitley about how Mary played an important role in bringing Divine Mercy to the world through St. John Paul II. Through doing Marian Consecration, Fr. Michael Gaitley gained a devotion to Divine Mercy. It is only appropriate that Pope Francis would choose this wonderful Marian feast to officially begin the Year of Mercy. I love how Sister Therese Marie Iglesias connected Mary to the concept of mercy. That Mary was given mercy before she even existed and that she carried mercy with her. My mom sees Mary as a woman of simplicity, which is true. 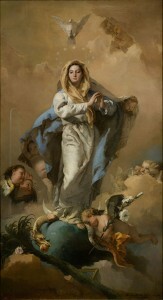 Mary was a simple, humble woman who had great responsibility thrust upon her. It’s one of the reasons the song “Mary Did You Know” is one of my least favorite holiday songs. It helps that it comes off like a person actually contemplating Mary. Granted, I don’t know Peter Hollens’s religious affiliation, but this is actually a version of “Mary Did You Know” that I actually like because of how honest it sounded. But the best part is that the answer to that song is actually out there. Mary is the answer to all the questions in that song. In her Immaculate Conception, she knew that the Lord delivered her before she was even born. In her Magnificat, she knew of all the great things that the Lord would go on to do. When shepherds and wise men came to visit, she contemplated their stories and knew that her son was the King of Kings. Although she was still in awe of her son when she and Joseph found him at the temple, she understood that there was a wisdom in her son beyond her own and acknowledged her humility in that moment.